Yesterday there was a documentary about London called "Hallo London" on the German TV channel called ZDF. I was seen for a very, very short glimpse. They asked me on my last trip to London if they might film me as an example of a fashionable girl in East London. 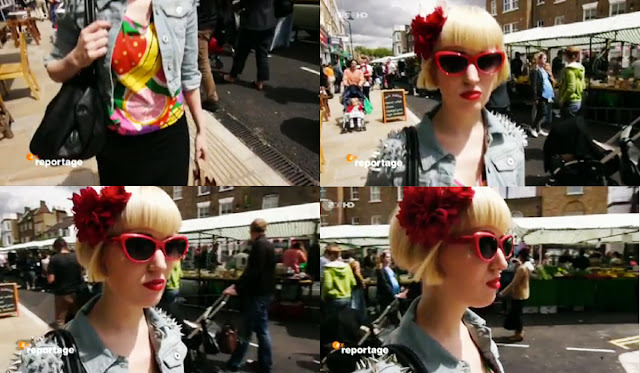 The documentary showed a few of my favourite places like Broadway Market, Brick Lane and the flower market at Columbia Road. I loved, that they focused on the East and skipped Buckingham Palace and the Wes Eend for once. The East is really the place to be and not just for the Olympics! In case you speak German and are interested to see a little bit of East London, you can watch this documentary online here. :-D Genau liebe Marianne! Ich habe sogar genau da gearbeitet und gleich um die Ecke gewohnt. Very ueber hip! Take Me to Oz, Dear Dorothy!